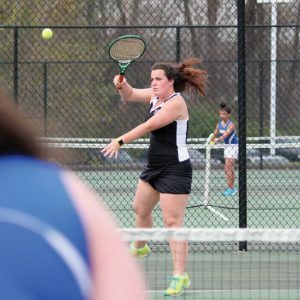 BEACON FALLS — Even during the midst of an excellent season for the Woodland girls tennis team, one quality of the Hawks in particular has stood out to coach Kate Gavigan. That spirit has translated into success for the Hawks, who claimed their tenth victory in their last 12 meets with a 4-3 win over Watertown on Wednesday. Woodland (10-4) also notched a 4-3 win over Holy Cross on Tuesday, a 7-0 victory over Ansonia on Monday and a 4-3 win over Seymour last Friday. Against Watertown, Amanda Doughney, Kaitlyn Crosby and Rachel Poulos won singles matches. The duo of Mia Piccolo and Alanna Carasone gave the Hawks the win with a doubles victory. The Hawks’ win over the Crusaders was among their most competitive meets of the season. Two of the Naugatuck Valley League’s best singles players, Doughney and Cross’ Elena Tormo, squared off in the feature match. Although Tormo earned a 9-7 victory, Gavigan was impressed with the quality of play. Gavigan also pointed to the play of her top two doubles teams, No. 1 Piccolo and Carasone and No. 2 Carly Erickson and Ella Parker. Doughney, No. 2 Morgan Stockheimer and No. 4 Poulos earned singles wins to lift the Hawks last week against Seymour. Piccolo and Carasone also notched a victory at No. 1 doubles. No. 3 singles Crosby and No. 3 doubles Morgan Swift and Bayan Galal have also played well in their positions this season. After wrapping up the regular season against Wilby on Thursday, Woodland will look forward to NVL tournament play. The NVL quarterfinals start on Monday. The semifinals are next Wednesday with the final set for next Friday at Woodland, followed by the singles and doubles tournaments the following week. 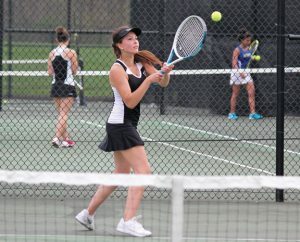 Editor’s note: This story has been updated from the article that appears in the May 11 print edition of the Citizen’s News to include information on matches played after press time through May 9.